All you Wrapunzel ladies know how that the weirdest baubles can make the greatest scarf accessories! Brooches, earrings, belts, and necklaces have all made their ways onto our heads! Now here’s a new idea (not my own) – a belt buckle! So cool! What do you think? I’m loving it so much that we’re definitely going to bring them to the store for you! I can see so many endless possibilities! Carmen is a true artist – and her talent for pairing gorgeous colours with the perfect accessories is nothing short of inspirational! She and I have known each other on facebook for a while… yes, she is the one that inspired the pearls post recently! I continuously wowed by her creativity… and her gentle and loving comments always let me know about the depth within her. In the following photos make sure you click on them each individually to appreciate how she puts things together – it’s incredible! I am so proud to introduce her to you as Wrapunzel’s Lady Wrap Star! Let me start by saying that for me, the decision to cover my hair came suddenly and with a conviction that lasted longer than I expected. It started in November of 2013 when my husband showed me a YouTube tutorial and since then I’ve been covering every single day. The journey I’ve made from then until now was nothing immediate or easy. Though I must admit that while I always had a hidden passion for covering, I had no one to personally teach me how to do it, so the few times I did cover were not the best experiences for me. In the YouTube video, a beautiful young woman was tutoring on how to wrap a scarf. This young woman was so humble and delicate that I was instantly captivated by her beautiful smile. The first video of hers I saw was set to Classical music, one in which she said nothing, but did a step by step demonstration. I was so amazed at how simple she made it look that I ran to my room looked for the few scarves I had collected in a box and started playing with them. I must admit that the first wrap I ever did popped right off! Like a typical beginner, I worried about my wrap staying in place, so I tied it really tight. It kept getting loose and moved around until it finally fell off. I had no clue that essentials like volumizers and velvet headbands existed until this beautiful girl spoke in another video about tips and tricks. Later on, I find out her name, Andrea, and she has a blog called Wrapunzel. I literally spent two whole days just watching video tutorials on wraps and looking at pictures on her site. Based on her recommendations, I went onto the Judith de Paris website and purchased my first volumizer and velvet headband… I was starting to make a decision that would affect my everyday life from that point on, and I felt like the happiest woman alive! While waiting for my volumizer and velvet headband, I decided to follow one of the recommendations on a Wrapunzel tutorial—I got one of my husband’s sock, rolled it, and placed it on my bun to create more volume. Then, I selected a really thin and comfy scarf and wrapped it on my head as a base, stuffing the ends inside the back for a little extra bulk. 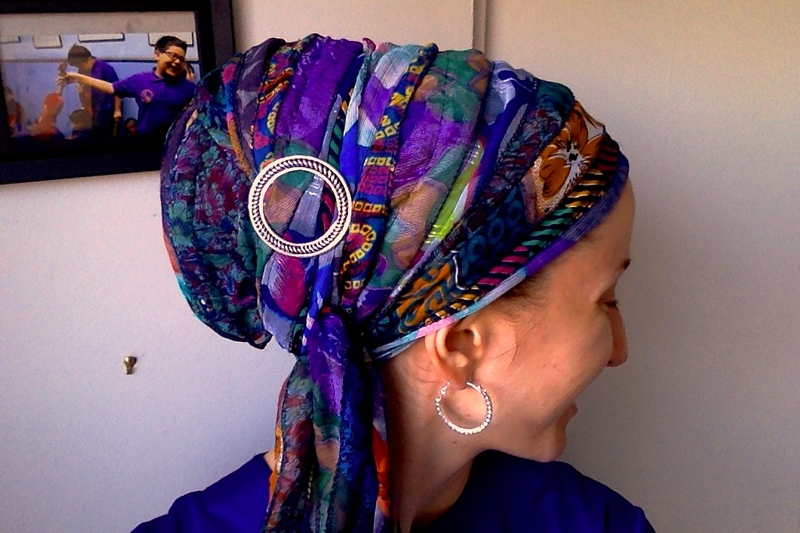 I then proceeded to place another scarf on top of the “base,” accessorized it, and walla…my first real wrap! I went to work that day, and that’s when it all began. The first few days were pretty quiet and went by with very few comments, if any. Then, as weeks started to go by, eyebrows were raised and questions began to flow. Being the only person that covers in my place of work, some of my co-workers began to inquire why I was doing it everyday. Co-workers in my immediate circle know why I cover since most of them are Jewish, but others from different departments are still probably asking themselves the question if they’re too shy to just ask me directly. Sometimes, others can really stumble on their words when they address the subject of my covering, but I have learned that being different can be an empowering side effect of following your heart. Before I covered, I felt bland and mediocre. I felt like I could have blended into the walls when in a crowd. There was nothing on the outside of me that reflected the more colorful, vibrant personality inside that Hashem created me to be. Since I started covering, everything about me has changed. Even my wardrobe has changed. Once that beautiful crown goes on my head, everything takes on a different roll than it did before; I’m different, transformed. I understand that you can’t show your entire self in every venue of your life. At the same time, spending hours of your life in an outfit that doesn’t express the person you really are feels terrible. I can’t even explain this transformation, but after it happens I feel beautiful and free. I am my own person, and I absolutely love the woman I’ve discovered I am through wrapping. When I leave work at the end of the day, I come home to my beloved husband whom I met in the beautiful island of Puerto Rico where I was born. I have also lived in New Jersey for 32 years and now reside in South Florida, where I have been working in a private school for close to 12 years now. I am the mother of six, with a Brady Bunch-styled family: three of my children and three of my husbands, and the grandmother to 13 beautiful grandchildren. After cooking dinner, I always choose the wardrobe I’m wearing for the next day—a habit I’ve had since I can remember. I love combining my wraps to the clothes I wear. The best part about this whole scenario is that at work I have students that visit me in the office just to see what color I’m wearing that day. When I wear their favorite color they come to see me more than once just to tell me that I’m wearing their favorite color. I have co-workers and even some parents that compliment my wraps and ask me how I do it or if someone does it for me. One parent even told me that she saw a beautiful scarf and remembered me when she saw it…she bought the scarf hoping she could learn to wrap it so she can wear it one day. I told her I would be more than happy to show her how. This is a word that means “modesty” in Hebrew, and I felt honored by his comment. My husband smiled and the young man later explained that his wife doesn’t cover because she feels uncomfortable as no one else she knows covers. I realized how difficult it can be to represent something about yourself that you love for fear of judgment that may or may not even exist. It can be so easy to blend in, to not “rock the boat” or “look for attention,” as critics might say. What we can sometimes forget is that those are sayings used to keep us all the same, keep us from being ourselves. One of the things I love the most is accessorizing my wraps. 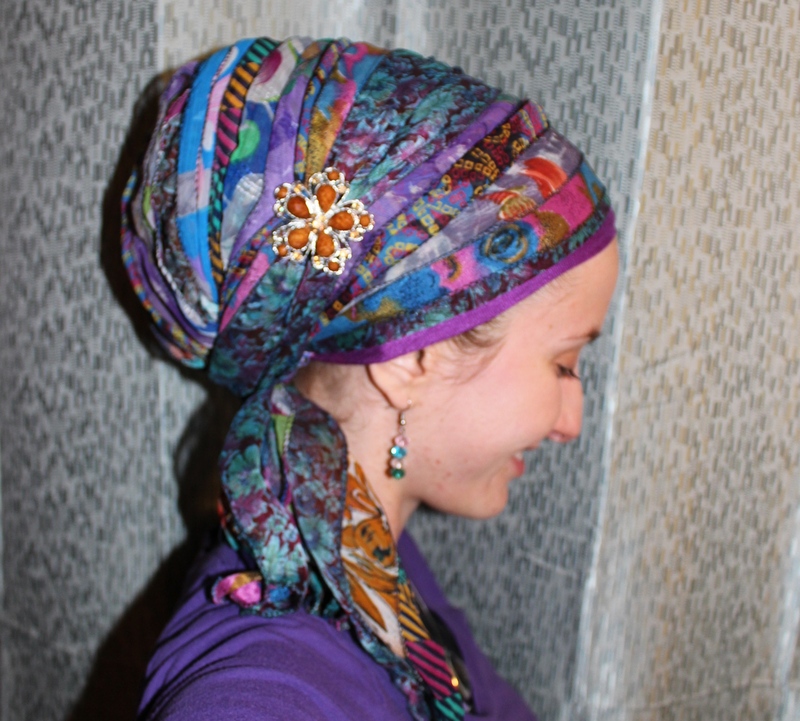 I tend to visit thrift stores, department stores and swap shops to look for different accessories for my wraps. One of the accessories I really love are pearls. If I find them in all color and sizes, big or small, you can be sure they will adorn my wrap! I even learned to make pearl necklaces into headbands by taking off the clasps and adding elastic in their place. My collection of hair covering continues to grow and grow, but pearls are always a nice personal touch! When it comes to tips and tricks for covering, I really have nothing of my own as every tip and trick I do know I’ve learned by watching Wrapunzel tutorials and other women that cover. I do however like the idea of wearing a thin scarf as a base underneath the one that will be exposed (for the extra volume). I wrap the base scarf to make it look neat and round; this way, I know that the top scarf will look neat as well (this is optional as I don’t do this all the time). Accessories can be tricky for me—I have so many that sometimes it’s hard to choose! There are times I’m afraid I may over accessorize, so I observe caution. When in doubt, a simple string of pearls goes a long way in my experience. From covering my own hair, I’ve learned that a woman that covers herself, whether for religious, health or personal reasons, will always be the center of attention especially in a community that does not use head covering. Positive or negative comments will surely arise, but that is something that can’t be controlled by the barer of the cover. I’ve been fortunate; so far I have received nothing but compliments from those around me. But I must say—the journey can be lonely. In my case, I’m the only one that uses a hair covering in my family, the community in which I live, and my work place (for the time being). The most amazing thing is, through discovering Wrapunzel, I have realized I am not the only woman going through this, not by a long shot! Reading the blogs and posts, seeing the daily/weekly pictures, and learning new wraps have inspired me to start and keep going with this self-expression. I am overjoyed that my husband love’s my wraps, too, and somehow I get the feeling this is something he planned all along (as it was him who found the Wrapunzel site). I am grateful he sticks up for me and pushes me to be confident in myself and my decisions. Here is how to do an amped up version of the Waterfall Twist! This is one of my favourite wraps and the option of doing the “twist” part with two colours opens up a whole new world of possibilities! Enjoy! Oh wow! Has it ever happened to you that you get a scarf and you just know that it will NEVER be folded up and put away nicely because it will become your new “most-worn”? Well, something magical happened when I found this scarf, and I just knew! It’s so soft and glorious! These end of the day photos simply don’t do it justice, but I tried! The teal and orange… yum! I think it’s my new favourite colour combination! What colour combinations are you loving lately??? Lady Wrap Star: Introducing Heather!! The first moment I saw Heather’s glowing face when she posted a photo on the Wrapunzel Store facebook page, I was bowled over! Her smile! The infectious love for hair covering! Wow! Who is this woman? A few photos later and it was more than clear that she had to be a Lady Wrap Star on this blog! I was also very curious to hear her story and get to know the woman behind the smile! Well, thankfully she was happy to share with us! Let’s hear it for Heather! I wasn’t raised frum. I was barely raised with any real Judaism at all. My idea of Orthodoxy was full of misconceptions and stereotypes galore. In my own naiveté, the idea of hair covering brought up images of women shaving off their glorious locks, only to deprive them and their husbands, and made me cringe. When my mother, a”h, learned I was becoming frum, she initially cried thinking that I would also do this. I assured her that this wasn’t the case. 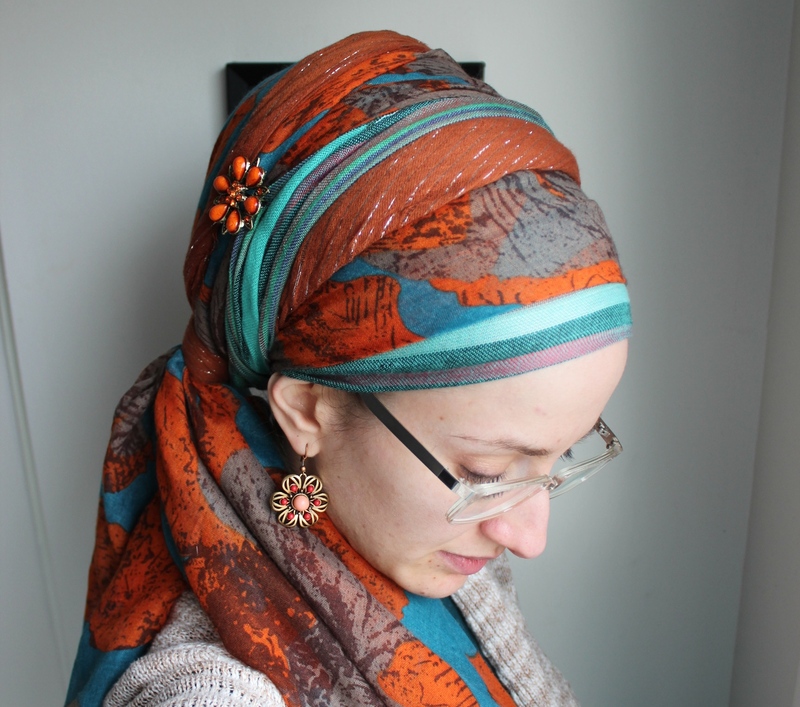 When I got engaged, I struggled with the idea of covering my hair. My hair was my most prized physical possession. It was long and red, and k”h, pretty amazing. So what changed my mind? I was teaching at NYU at the time and living on the Upper West Side. While I was waiting on the subway platform, someone came up behind me, and raked his fingers through my hair, from the nape of my neck to the ends and then just walked away. I never saw his face. Of all the parts of me to be groped on the subway (and as New York women know, unfortunately that happens) he chose my hair. I immediately called my husband (then fiancé) and told him what happened, and we both decided that Hashem had just sent us a message. That doesn’t mean that it was easy for me. I started with berets (it was the 90s, and that was the cool thing) and moved on to hats of all sorts. When I started teaching at the Yeshiva of North Jersey, I chose a sheitl because that seemed to be the thing to do. My main problem was that I would have to cut my hair to fit under the wig, and every time I did it made me sad. Wrapping allows me to keep my hair as long as I (and my husband) likes. One of the reasons that I became frum was that I craved a connection to the past. I tried to connect to the generations before me, all of whom lived a life of Torah and mitzvot. When I came across the Wrapunzel website, the first thought was that the Imhaot did not wear hats and they certainly did not wear sheitls; they wrapped their long beautiful hair. I could imagine them wrapping, and showing nothing but their beautiful shining faces, and I wanted to emulate that. Truth be told, my husband was not initially a big fan, as he loves my hair, and for him, a sheitl is as close as you can get in public. But what I told him was this: The hair is for us, but the cover is mine. He couldn’t argue with that. I spent (spend) many hours watching Andrea’s and Rivkah Malka’s tutorial videos, and they are beautiful. They are always smiling and glowing, and there is no way that radiance shows with the distraction of a sheitl. To each their own of course, and there are some beautiful sheitls out there, but there is nothing like a wrap to show the true beauty of an Aishes Chayil. 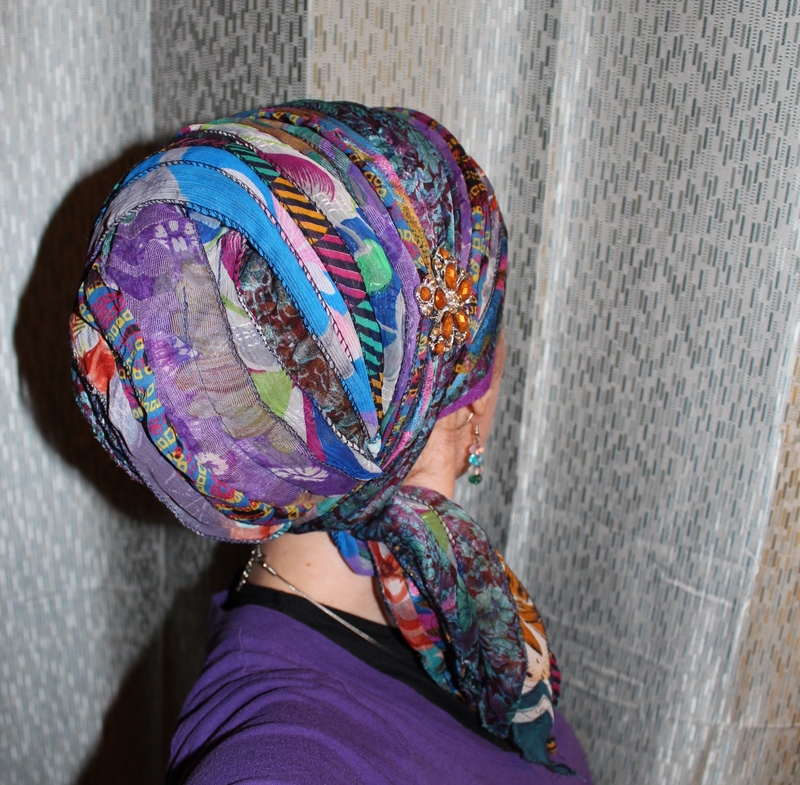 How to Cover your WHOLE Head with a Sari Scarf! Those of you that have been following my sari scarf saga (which started before this blog and even andreagrinberg.com were even in existence) will understand how OVER THE MOON I am about this sari scarf discovery! 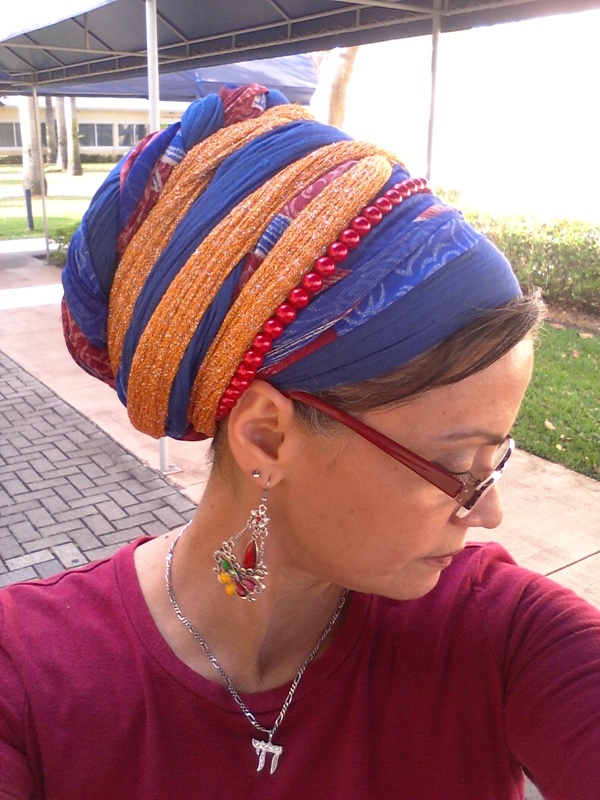 Last Shabbat, my hands did something miraculous when tying my sari scarf – they figured out how to cover my entire head with the sari scarf (it’s normally not wide enough to do this!) And then I did it again and again! Look! I know! Can you believe it’s actually possible? I almost couldn’t believe my eyes and am SO happy!! Anyway, after doing this the first time, I proceeded to wrap this style on every woman I encountered thereafter who was interested in wearing a sari scarf! (There were many workshops last weekend – check out the Wrapunzel store page for pics!) So now I have to ask; WHO WANTS A TUTORIAL? Hope you’re all enjoying this beautiful (and brisk where I live) evening! Love love love!! !